Maricopa County News recently shared a video about Rio Salado College student Jessica Angulo and how she is using her workforce training to gain real world experience as an electrician apprentice. Angulo took GED® test prep classes at Rio Salado College Downtown and enrolled in the college’s Energy Systems Technology I-BEST Program. 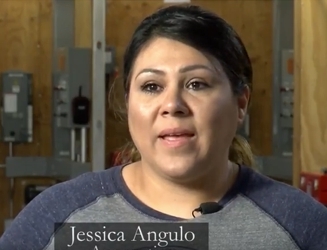 After earning her high school equivalency diploma, Angulo was admitted to an electrical apprenticeship program, where she is thriving. The video also features a cameo by Blair Liddicoat, Associate Dean of Adult Education at Rio Salado. -Video courtesy of Maricopa County, and producer Erika Flores.